Globus is set to further strengthen its position as a leading provider of hand protection solutions with the launch of the high performance impact-resistant SHOWA 377-IP nitrile foam grip glove. Designed to protect workers across a range of industries including oil and gas, construction, rail, mining, logistics and utilities that face the risk of impact-related hand injuries, the new SHOWA 377-IP glove combines impact protection with wet and dry grip performance, durability, comfort and dexterity. Thanks to its revolutionary design, the back of the hands, knuckles and fingers are protected by SHOWA’s fully integrated and highly flexible Thermoplastic Rubber (TPR) shields that absorb and dissipate the force of an impact, significantly reducing the threat of injuries. Flex points have also been built-in to the TPR shields so that when the hands are gripping tightly, the shields aren’t ‘opened up’ safeguarding the bones against potential impact exposure. On the palm, SHOWA’s patented nitrile foam grip technology – which extends to the fingertips – disperses liquids including oil, grease and water to deliver outstanding grip in wet and slippery conditions. The additional underlying layer of durable film nitrile bolsters protection to the entire hand. The result is a glove ideally suited to anyone working in physically demanding environments with wet handling conditions where impact risks exist. “The SHOWA 377-IP glove fills a real gap in the market that currently exists where there are impact risks to workers’ hands. You only have to look at the latest figures from the Health and Safety Executive to see how risk-exposed the hands are – in particular from handling and ‘struck-by’ impact injuries. Handling injuries remain the single biggest cause of over 7-day injuries in the UK*, with ‘struck-by’ injuries the fourth phentermine 37.5 with prescription largest cause,” said Globus Marketing Manager Steve Shale. “The development of the SHOWA 377-IP provides the perfect balance of impact protection, wet and dry grip, hand flexibility and liquid resistance. It also overcomes any lack of finger flexibility that can be evident in other impact protection gloves. Feedback from workers thus far has been extremely positive, many being impressed with the levels of grip and protection it offers whilst working in oil-based mud and when concreting.” he added. Ergonomic Design – provides comfort for extended wear and reduced hand fatigue. Designed using SHOWA’s patented manufacturing processes resulting in a glove style that mimics the natural curvature of the hand. Bright Blue and Green Colour – users benefit from a highly visibly glove which can help safety in poorly-lit or gloomy working environments. This increases the awareness of the users’ hands by others. Grip – excellent and proven grip performance in oily, wet and dry environments thanks to SHOWA’s patented nitrile foam coating to the palm and fingertips. Flexibility and Tactility – has the flexibility and dexterity that workers really like leading to increased wearer compliance and greater worker efficiency. Part of the Renowned Family of Patented SHOWA Nitrile Foam Grip Gloves – SHOWA 377-IP is an addition to a product family with an impressive legacy. Gloves featuring the same SHOWA patented nitrile foam grip technology (SHOWA 377, 379, 477 and S-TEX 376) are already trusted extensively by workers across a range of industries. 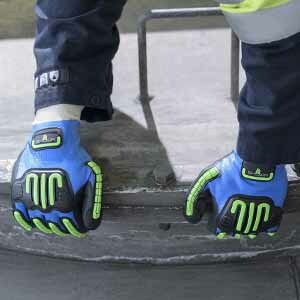 For more information on the new SHOWA 377-IP gloves visit www.globus.co.uk, email sales@globus.co.uk or call 0161 877 4747.